The ingenious Stikkan is a simple and safe wall-mounted handtool that produces kindling quickly and easily no more hatchets, near misses or bending. 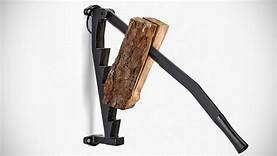 Simply attach the Stikkan Kindling Splitter to your wall, insert a log, and lower the steel cutting wedge to produce a nearly effortless kindling supply. The streamlined European design is durably crafted from cast iron with a black finish for a lifetime of use. Stikkan is easily mounted on the woodshed wall, by the fireplace or wood stove, or on the back porch. Stikkan was invented 1982 by Tormod Lie in Telemarken, Norway, and is now manufactured in Sweden. Warm nights by the fire always sound great until someone has to chop the wood. The new innovation of kindling splitter could save your back from the aches of chopping. The wall-mounted chopper is the stikkan built by plow and hearth. The mount includes several levels to optimize the chopping angle for easy cutting. When you are done with the splitter, simply store it in its locked position for safe keeping. It does not require any maintenance with no rust, no need to sharpen and offers safety mode to the user. The Elegant European design is durable and long-lasting.